This topic contains 186 replies, has 52 voices, and was last updated by Kach069 11 months, 1 week ago. Looks and plays great! Physics feel really natural. Great job! I love the color mini-DMD. > The GI lights are controlled by an Aux Rom Controlled board. The Aux board is connected to a relay that cuts the power to the GI lights. GI is controlled by the standard IO board, so the added GI support should work for all Sega/WhiteStar tables. This IO board is almost identical on newer Stern SAM tables, which is why it was easy for me to also add support for it here. I think the some AUX boards (specifically, the mini-dmd) borrow other bits from the same output though. > table now needs DJRobX modified version of PinMAME. The table will still work with older PinMAME’s, the GI lights just won’t turn on. It looks like this table is very much a “day mod” (still well lit with GI off), so it’s not much of a dealbreaker in this case. Thanks for adding support and testing the new feature out! *Edit* attaching the build here so people don’t need to go hunting through the thread. The Homer head looks kind of strange for me in FS, is it like this for anyone else? Yeah. you can pretend it’s Grandpa Simpson. This is great. I do have the Homer head that doogie posted also. Someone remind me why the sound is so low on this table. I cant seem to get into any of the Rom settings to adjust volumes, free play, ect. I’ve been in there before I know because I reset the high scores. None of the normal options work 7, 8, 9, 0, even the end key doesnt work. I don’t think you want to mess with Z-scale. It can change the physics of the table. For example, rubbers at a height of 25 with a Z-scale of 1 would be at 50 with a Z-scale of 2. Looks like more of a lighting or reflection issue to me. Would adjusting the environment map or material help? I was wondering if this table is still being worked on. It looks great so far and I’m hoping it still can be completed. I think it will eventually get completed. Assassin had been adding some things but is working on completing the System 11 tables. High Speed is great. I uploaded a version with GI lights a few days (weeks?) ago. I’m going to steal the spot light settings from Dozers TWD LE table, and that’s about the last thing I’m going to do to the table. I’m still not sure if I’m going to upload the table to the download section. I will not consider this table to be finished until it gets the correct Bart primitive. Unfortunately that is not something I can make. Perfectionist! nothing wrong with that 32! Thanks 32! Hope it get released/finished soon. This is one is super fun to play. The Homer head looking like that in FS has to do with how it’s material and smoothing are being effected by the environment map, often times all it requires is the material having it’s glossy turned all the way down to 0,0,0 but some times you also need to add a bit of a blur to the environment map to reduce unwanted effects on toys. you are more then welcome their are two things we need to updated. under the TV, their is a solenoid controlled post, I don’t know its purpose. The ball does not make contact with the post on the VP 9 version; because of the walls that surround it. as of right now the ball is stopped by the post, and is only released when the table starts to activate all the solenoids. this is not a normal, the (all) solenoids are only triggered when the ball gets stuck. I’m assuming the table should start with the post dropped, and the solenoids raises the post to stop the ball. We need to ask someone who owns this table to confirm the operation of that post. The second problem, is just my personal opinion, but I never uploaded this table because I want to correct Bart toy for this table before I consider it finished. @32assassin I don’t own the table, but I did find info here, search for “ball lock”, is that the one you mean? 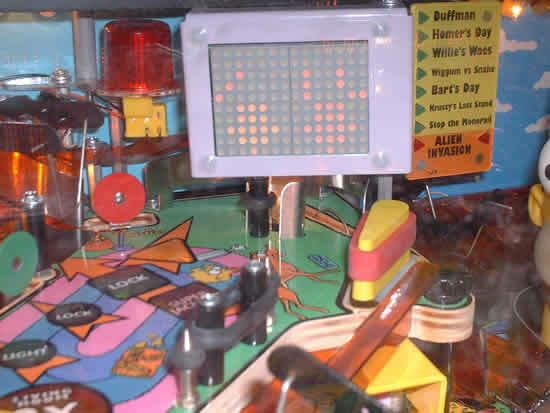 If you successfully make either shot to get to the living room, the ball is kicked up onto the upper playfield where you shoot the ball into the loop under the TV to a temporary ball lock. There is a solenoid behind the TV to the right, which stops the ball on the switch and just above the flipper. A mode start animation is played out on the main display, the TV warns you that the ball is about to be released and then the ball is freed. Flipping the ball up the metal ramp to the left sends it to the couch and locks it if lock is lit.